Gold Pendant in 14K Three Tone Gold . 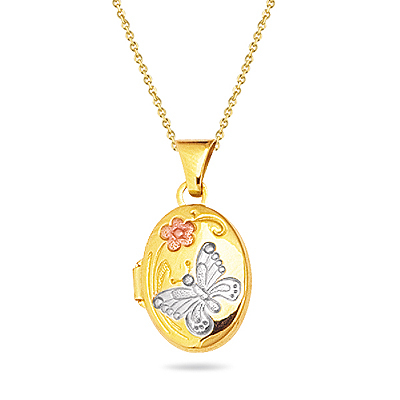 This exquisitely bedecked Three Tone Gold Pendant depicts a butterfly in White Gold and a flower in Pink Gold, bejeweled on the surface of Yellow Gold. This awe-inspiring pendant comes finished with an 18-inch 14K Yellow Gold Cable Link Chain. Wear this breathtaking pendant for a chic look.